We are happy to introduce our new WordPress lawyer theme which can suit any lawyer because it has high-quality design and structure. The Gridgum store has Bootstrap version of this theme as well (https://gridgum.com/themes/lawyer-bootstrap/), which has multiple positive sides but if you are a beginner in web development then our team would recommend buying this WordPress version. WordPress can make your life easier and do all the work for you. It is very easy to manage because it has a website content management system (CMS). Of course, it costs a bit more but if you are part of a serious company who wants to have the well-managed website then this is the product you have been searching for. 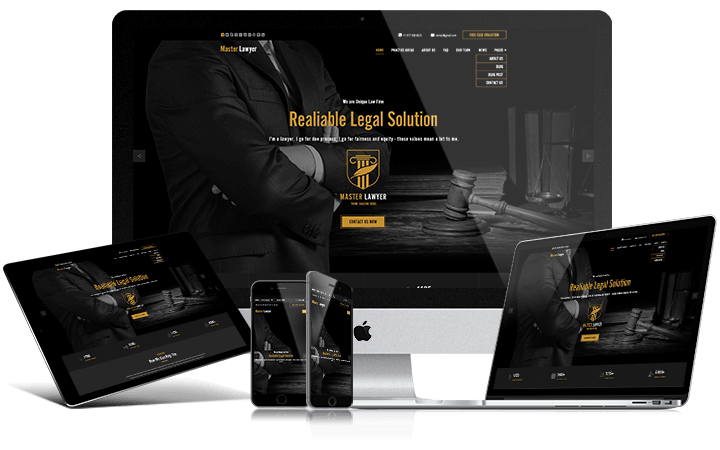 But if you are more interested in WordPress and how it works just go this link: (https://gridgum.com/wordpress-cms/) The WordPress Lawyer template is fully responsive, which means that it can be opened from any device like mobile phone, tablet, PC and etc. From every device, the template will take a different shape to keep the perfect design and structure. 2. Practice Areas – which is all about the services you are offering to the customers, explained in a meticulous way. 3. FAQ – the page of frequently asked questions, which are from customers or visitors, with answers. 4. Our Team- the place where you can describe your team, previous works, and achievements. 5. News and Pages- it has two extra pages and two different styles for the contact page. The whole template is designed to make customers lives easier and to help them to find the desired attorneys or services. Even though it is very easy to work with WordPress template there are still chances that some questions will emerge. But again, it is not a problem because our support group is here for you on 24/7. Just leave your question or concern in the COMMENT section and wait for our response. To make explanation process smoother we are offering detailed video tutorial which will solve every problem. 1. 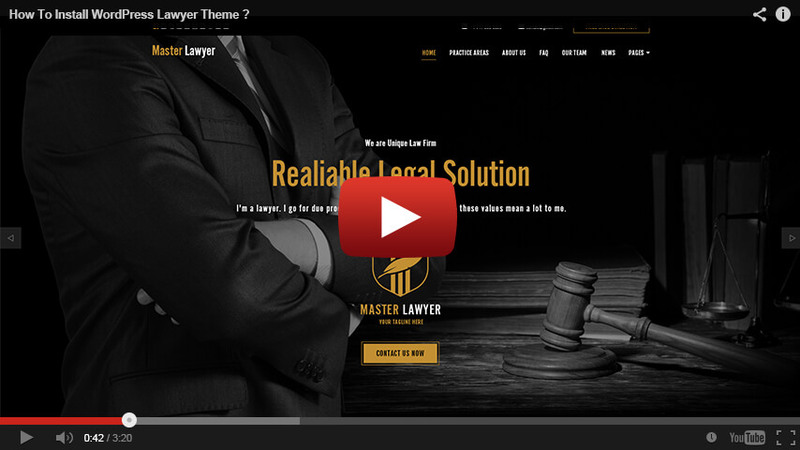 HOW TO INSTALL LAWYER WORDPRESS THEME ? When I installed my logo in the heading appear smaller than the logo in the demo. create bigger logo and upload it again then see if it is again small do bigger and upload again. Why the logo shows up very small? Please click on Yellow Button "Video Tutorial" see step by step guide how to install This template and follow. As you know all original images doesn't include in the template package, it is for preview purpose only. If you would like template with original images please let us know and we will send you link for payment $20. Do not worry about this. We have 2 way to help you. 1. If you send us your host information, your hosting cPanel address, username, password and your site URL address, I'll install it for you. It is 3 minutes job for me. 2. If you do not want to send your host info, I'll create step-by-step video tutorial how to install this template and show you. Please let me know which help you need first or second one. I've sent you an e-mail with a different address that you can reach me! I'm waiting for the e-mail. Thank you in advance George. Thank you George, the template appears to be installed yes, however i did not receive an email with said video nor the wp login info, please send it to the email that i've submitted the cpanel info etc ... I'm waiting, thank you in advance! hi, your mailbox do not work, we tried to send several times but returned all mails please send me working email address. 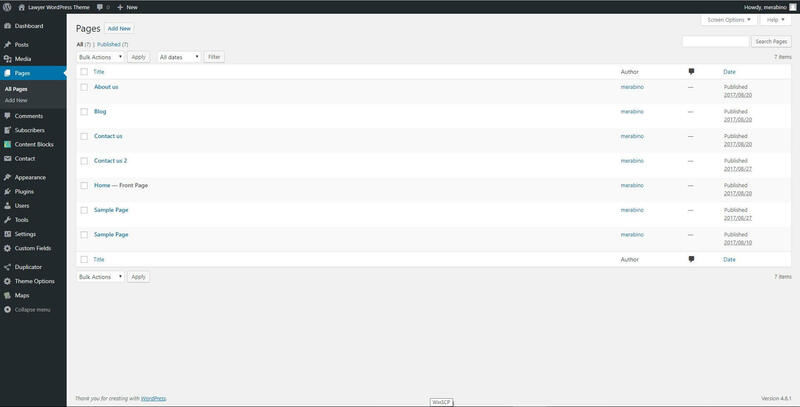 Requested the theme to be installed, waited 20+hours and apparently it was installed but haven't received the login info to access wp-admin sent several e-mails but haven't received a reply back... decided to get into the phpMyAdmin database to manually change the password of the wp user got it and logged into the wp panel, however the template doesn't load header/footer and there is no option to edit the text, appearence,widgets, etc through the wp panel... hopefully I'll get an answer posting here and have the theme re-installed or something to fix these issues. Thank you in advance. Hello, just purchased the theme and i am unable to install the theme, once it finishes uploading i received the following message: "The package cannot be installed. The theme doesn't have style.css." - Installing the 539.zip file that was avaiable for download straight up to a working wordpress environment, need assistance... ty in advance. seems you have installed not correctly, please send me your host information on the following email address: support@gridgum.com and we will install it for you. need following information: your hosting cPanel address, username, password, your website URL address.